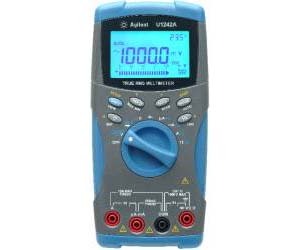 The Agilent U1242A multimeter enables you to check more with wide measurement ranges. It features true-RMS readings on its 10,000 count display. The adjustable backlighting enables you to complete your jobs even in subdued lighting conditions, and prolongs the battery life at the same time. Your maintenance tasks are greatly simplified with its built-in switch counter, harmonic ratio, dual temperature and differential temperature capabilities, with just a push of the button. The meters have high safety rating with CAT III 1000V protection and certified to CE, CSA and UL standards. Better yet, the U1240A Series come with certificate of calibration and test report - at no extra cost. Price shown is for typical configuration.